Growing up in a large family held together by their strong Catholic faith, Freddie Steinmark had always dreamed of attending Notre Dame. Freddie was an extremely fast and gifted multi sport athlete, but at only 150 pounds he failed to impress most college coaches despite winning top scholar-athlete awards and leading his high school football team to the Colorado State Championship in 1966. Freddie's coach sent highlight film to friends at The University of Texas and after meeting Freddie, Assistant Coach Fred Akers decided to look past Freddie's physical size and focus on the magnitude of his impact on the field. In 1967, the UT freshman Yearling football team had their first undefeated season in seven years. The next year Freddie would become only the second sophomore to start for Coach Darrell Royal's Texas Longhorns, who ended the 1968 season as the fifth ranked team in the nation. Freddie was at the top of his game and growing in to a great leader on the field. The summer before his junior year, Freddie was home in Colorado playing in a semi-pro baseball game when we felt a spasm of pain in his left leg just above the knee. This was the first indication of the malignancy growing at the tip of his femur for the past six months. The Longhorns would go on to play and undefeated season in 1969 with Freddie on the field despite the increasing pain in his leg. Less than one week after the final game, Freddie was diagnosed with a malignant bone sarcoma and his left leg was amputated at the hip. He watched from the sidelines as his Texas Longhorns beat Notre Dame in the 1970 Cotton Bowl. Freddie lost his battle with cancer in 1971 and that same year President Nixon signed the National Cancer Act of 1971 funding cancer research throughout the country. Recommended. Freddie Steinmark started at safety for the undefeated University of Texas Longhorns in 1969. In the thrilling "Game of the Century," a come-from-behind victory against Arkansas that ensured Texas the national championship, Steinmark played with pain in his left leg. Two days later, X-rays revealed a bone tumor so large that it seemed a miracle Steinmark could walk, let alone play football. Within a week of the Arkansas game, his leg was amputated. A gritty, undersized player, Steinmark had quickly become a fan favorite at Texas. What he endured during the Longhorns' memorable 1969 season, and what he encountered afterward, captivated not only Texans but the country at large. Americans watched closely as Steinmark confronted life's ultimate challenge, and his openness during his battle against savage odds helped reframe the national conversation surrounding cancer and the ongoing race for a cure. 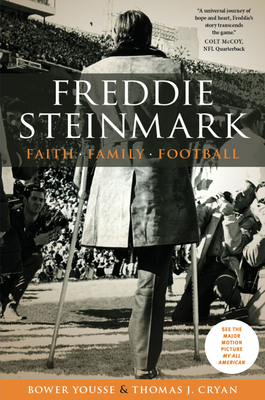 Written with unfettered access to the Steinmark family and archives, Freddie Steinmark: Faith, Family, Football is the exploration of a brief but full life, one that began humbly but ended on a grand stage. It is a fitting tribute to a legendary Longhorn whose photograph, emblazoned with the word "Heart," flashes on the Freddie Steinmark Scoreboard's Jumbotron prior to each home football game in UT's Darrell K Royal-Texas Memorial Stadium at Joe Jamail Field.